With great expectation, Chile and the world are awaiting the results of this weekend’s presidential election. Former President Eduardo Frei, from the center-left Concertación will try—despite most predictions—to retain the government for his coalition. But the favorite is millionaire Sebastián Piñera, the candidate from the Alianza right coalition. In last month’s first round of voting, Piñera, with 44 percent of the votes, scored 15 percentage points higher than Frei. 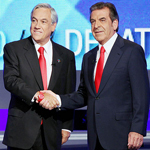 Most polls had been giving the victory to Piñera, but a January 13 poll published by MORI and directed by Marta Lagos reports that the race is too close to call. The poll gives 50.9 percent of the votes to the Alianza candidate and 49.1 percent to the Concertación. The governing coalition—energized by these results—is making a strong final push to win the election. The winner will take office after President Michelle Bachelet, who ranks as the most popular president in Chile’s history, with an 81 percent approval rating. That fact, together with a track record of almost two decades of successful administrations, makes the Concertación very strong. But after being in office since the transition to democracy in 1990, the coalition began to lose energy and get bogged down by its own bureaucracy. The candidacy of Frei, a long-time politician without a broad internal consensus, is an expression of that situation. Internal crisis in the governing coalition paved the way to the sensation of this electoral season: the rise of the “maverick” candidate, Marco Enríquez-Ominami (ME-O). ME-O, a young congressman, left the Socialist party after he was prevented from being its presidential candidate. As an independent, he blended innovation with charisma, youth, personal history, and a message of change, allowing him to become the most successful independent candidate in his country’s history by securing 20 percent of first-round votes. In the past weeks, both Piñera and Frei have been trying to court ME-O’s voters—the block that will define the election. Piñera has tried to bill himself as an expression of the change that Ominami’s voters wanted, while Frei has focused on plans for a progressive agenda—a tactic that may ultimately win over more ME-O voters. But with neither candidate pulling ahead after this week’s final televised debate, the undecided voters are sure to have the last word. Enríquez-Ominami has promised not to endorse any candidate. But after being pressured by the Concertación, ME-O publicly expressed that he will not vote for Piñera. His reasons include ideological differences and the fact that members of the Piñera team were in the government during the Pinochet dictatorship, a period in which Enríquez-Ominami’s father was killed. President Bachelet immediately congratulated ME-O for his announcement and repeated that the choice of president is critical for Chile’s continued role as a modern and just society. Undoubtedly, this can only help Frei’s electoral chances, assuming it isn’t too late. In any case, the next president will be in a position to consolidate Chile’s path to development. If Frei is elected, he will have to listen to the voices that are calling for openness, renewal, and change. With a candidacy that never elicited much excitement, and running against unfavorable polling numbers, a Frei victory would be a result of his hard-fought candidacy. If elected, he will have to continue fighting to gain Chileans’ hearts. But if the polls are correct and Piñera becomes the next president, it will mark the beginning of a new era in Chile. After four consecutive terms of the Concertación, a democratic right will be back in office to guide the country’s destiny. A transition in government could be an interesting sign of Chile’s institutional strength, showing a healthy switch of power that would add more credibility to the Chilean case. Sebastián Piñera will have the chance to prove that the democratic transition is over, and Chile and its people are prepared to leave behind Pinochet’s turbulent legacy. Juan Cruz Díaz is a consultant to the Americas Society and Council of the Americas and senior editor of Americas Quarterly. He is also managing director at Cefeidas Group (www.cefeidas.com).